An experiment: I’m honoring my favorite restaurants and other places by spoonbombing them. 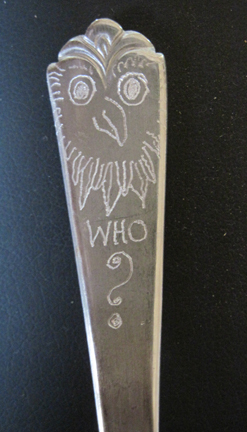 I engrave spoons (well, OK, sometimes forks too) especially for that particular place, and leave them with the dishes on the table when I leave. Will the spoons keep circulating in the restaurant? Will visitors slip them into their pockets? These are my burning questions, this is my research! I’ve left spoons at Wilko, Cafe Passe and Cafe Zope in Tucson, and at the Pigeon Point and Point Loma Hostels in California. I spoonbombed New York City and left spoons in Provence en Boite and Trix in Brooklyn, and at Think Coffee in Manhattan after the October 15 march from Wall Street to Washington Square. If you find one of my spoons, send me a message with the form below, and tell me the story! You can see the stories people send me in the NEWS section of this site.